Ever since I posted this Spaghetti Squash and Meatball Frittata, I’ve been brainstorming more ways to transform popular pasta dishes into something healthy and creative using spaghetti squash. Cajun chicken pasta immediately came to mind. It’s a dish I rarely make and never order at restaurants. I mean, it tastes amazing, but if I were to order it, I would most likely eat the whole plate and then feel swollen and stuffed afterwards. I just hate that feeling. But! 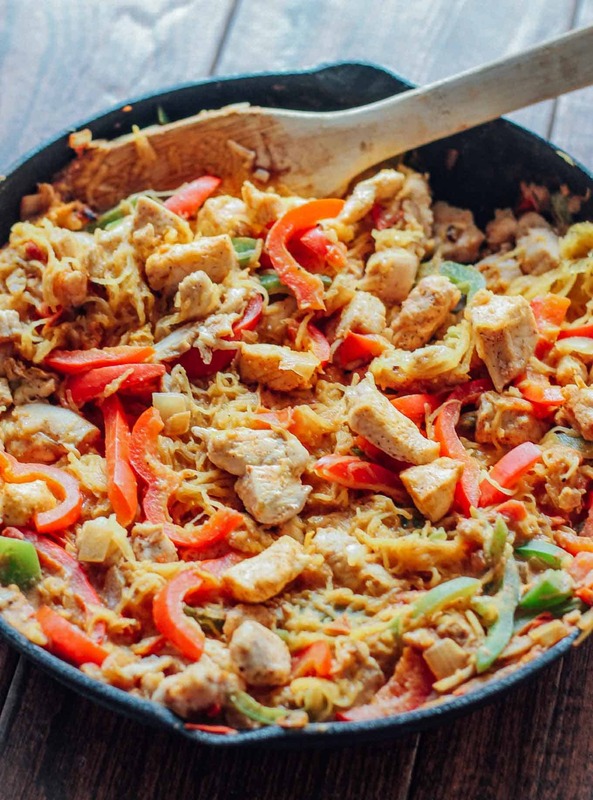 With our handy pasta swap, spaghetti squash, I’m ready to make a healthier version of Cajun chicken pasta. To really bulk up the nutrition and serving size of the dish, I’ve added plenty of colorful bell peppers. Plus, I’ve lightened up the traditional spicy alfredo-like sauce by using a dab of reduced-fat cream cheese in place of heavy cream. The squash. Use your preferred method of cooking squash until just tender. I usually roast mine (directions in the recipe). Once cool, scrape out the strands. The chicken. Season the chicken well and brown it in a saute pan. The veggies and sauce. Add chopped veggies to the pan and sauté until tender. Stir in the cream cheese until melted. Bake. Add the squash, stir, and pop the whole pan in the oven. Bake for 20 minutes. Garnish. Sprinkle fresh parsley and grated Parmesan cheese over the top. 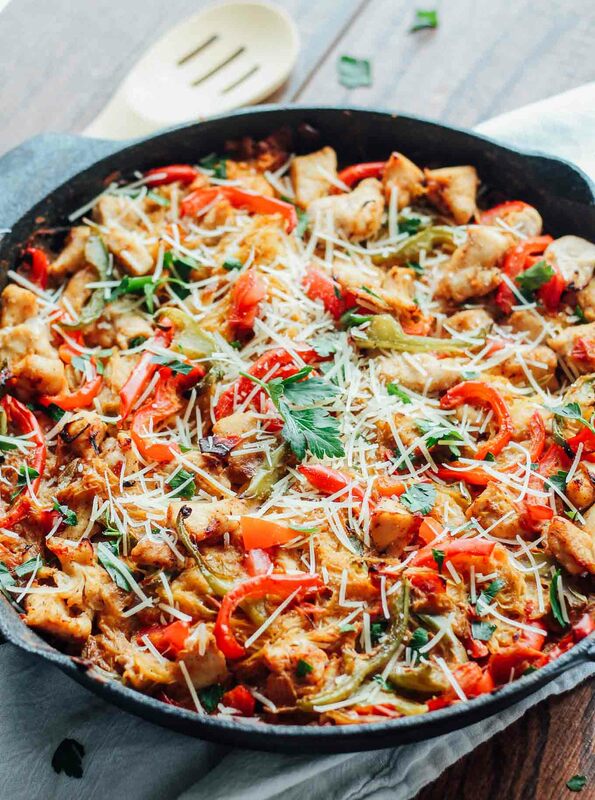 I used a cast iron skillet for this recipe, but feel free to use any oven-safe pan. Or, transfer the mixture to a casserole dish before baking it in the oven. How do you like our family jargon? “Cooling agent” is my husband’s term for sour cream. Feel free to add a dollop on top for some extra tang and creaminess OR to tone down the heat from the Cajun seasoning. Despite the fact that we are out of “cooling agent” at the moment, my husband still packed this for lunch 3 times this week! Looks like I’ve found a new recipe to add to our dinner rotation! Roast the squash: Preheat the oven to 350 degrees. Cut each spaghetti squash in half lengthwise. Scoop out the seeds. Rub ½ tablespoon of olive oil on each half and sprinkle with ¼ teaspoon of salt and ⅛ teaspoon pepper. Place in the oven, flesh side up, and roast for 30 minutes. Let the squash cool. Cook the chicken: While the squash is roasting, toss the chicken breast cubes in 1 tablespoon Cajun seasoning and ¼ teaspoon salt (if Cajun seasoning is salt-free) until evenly coated. Add 1 tablespoon of olive oil to a very large sauté pan or skillet (preferably oven safe) over medium-high heat. Once heated, add in the chicken and sauté for 7-8 minutes, flipping the pieces once to brown on all sides. It’s best to brown the chicken in 2 batches so you don’t crowd the pan. Transfer the chicken to a plate. Cook the veggies: To the same pan, add the onion and sprinkle with ½ teaspoon of salt. Sauté the onions for about 2 minutes until softened. Add the garlic and sauté for another minute. 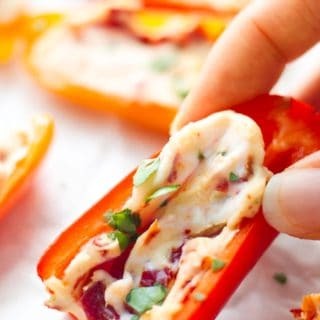 Add the bell peppers, 1 teaspoon of Cajun seasoning, and sauté for 2-3 minutes until softened. Then, add in the diced tomatoes and cream cheese. Stir gently until combined. Take the mixture off the heat and set aside. Add in spaghetti squash: When the squash is cool enough to handle, use a fork to scrape the spaghetti strands out of each half. 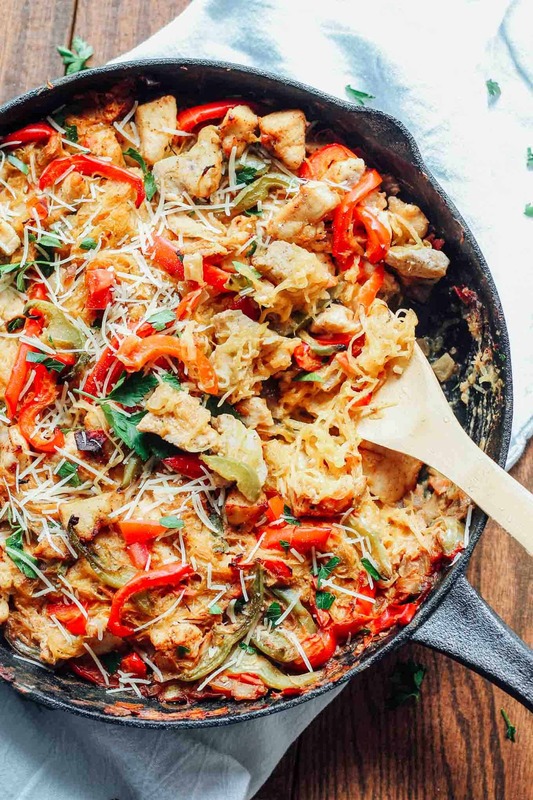 Add the spaghetti squash and the chicken to the sauté pan and toss to combine. If using an oven safe pan, place the skillet in the oven. Or, transfer the mixture to a casserole dish. Bake and serve: Bake at 350 degrees for 20 minutes until the edges are slightly crispy. Garnish with fresh chopped parsley and Parmesan cheese before serving. This recipe sounds delicious! Do you think a dollop of coconut cream would be an acceptable substitute for the cream cheese in order to make this a paleo-friendly dish? Thanks! Absolutely! That’s an awesome substitution idea! Since coconut cream isnt’ as dense, I’m thinking you might need a few dollops to really get a really creamy texture. If you try it, let me know! Delish! Made this last night and because I’m on a low FODMAP diet, I switched out a few ingredients (no dairy, onion or garlic). I made my own Cajun Spice (minus onion and garlic powder) using a hot smoked paprika. Julienned red pepers and then added julienned jalepeno strips and the tops only of green onions and some cilantro in the dish. Used whole fat coconut milk for the sour cream and a can of organic diced tomatoes with roasted green chillies. Because others don’t have a palate for goat cheese, I put a couple of chunks in my own bowl, where it melted and added a nice extra creaminess to the dish. My husband couldn’t stop eating it! I was worried about missing the garlic & onion, but with the spicy smoke paprika and the green onion tops, didn’t notice the absence at all. This will become a regular in our house for sure. FIghting over the leftovers this morning as I write. LOL. Thanks for the great idea! Your substitutions sound amazing! I’m so glad you were able to tailor this dish to fit your lifestyle and dietary needs. BTW, the melted goat cheese has me drooling right now! Just wondering how many tomatoes you used. You have it listed twice in the ingredients. 2 or 3 or 5? 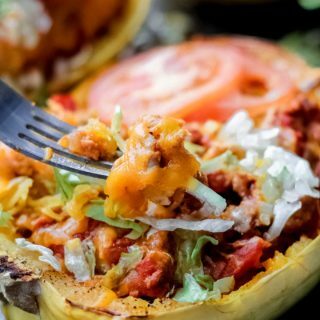 I was excited when I found this recipe, my husband loves cajun food and I love spaghetti squash. It was wonderful!! 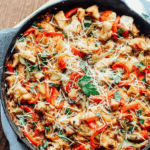 The taste was great and all in one pan is very nice! I had some cooked spaghetti squash in the fridge and added it before putting in the oven for an even quicker meal. Thanks so much for another meal to add to my recipe book! Hi Carolyn! That’s so awesome to hear. 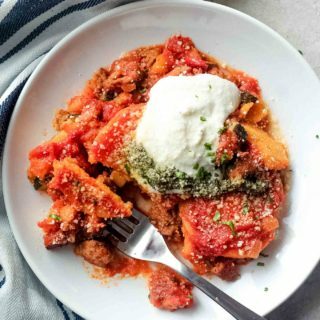 I love that you had pre-cooked spaghetti squash ready to go for an easy, one-pot meal. Thanks for the sweet comment! We totally forgot to bake for 20 minutes once done…plus add the parsley and Parmesan…haha. But it was still so delicious!! 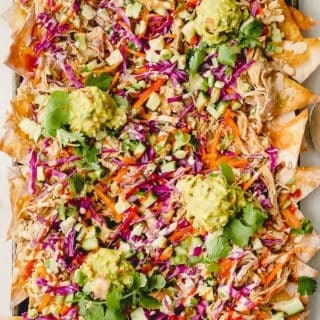 One of our new fav recipes for sure!! LOL! Yes you totally don’t need to bake at the end! So happy it worked out for you! Very delicious only thing I did different was add half on a lemon squeezed and some Greek yogurt to make the sauce even creamier (I used more chicken and veggies so it needed it). Thank you for a new staple of a recipe! Great additions! I bet the lemon and Greek yogurt added an awesome punch of tangy flavor. I never thought to use Greek yogurt to make it creamier, but it’s brilliant! Will definitely need to try that next time I make it! This was delicious! Made it for dinner tonight. I added a bag of spinach as well to add extra veggies. Will definitely be making this again! Thank you! That’s great, Sarah! Awesome idea, bulking it up with some spinach! You’re welcome, Nikki! You’ve got quite a busy schedule tonight, but sounds like you’ve got dinner handled! 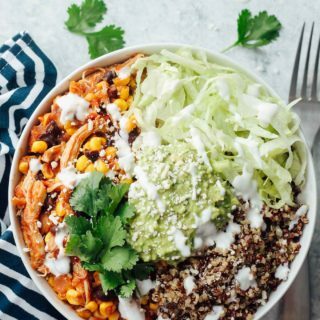 Using the crockpot for this dish is a wonderful idea. I hope it’s a hit with your family. Thanks so much for commenting! 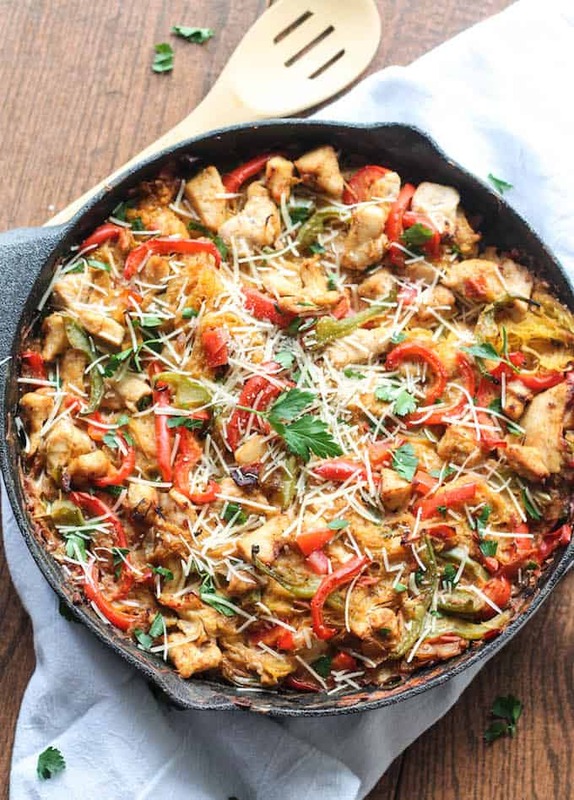 this is a great low carb receipt little bit of work but well worth it my husband loves this dish very tasteful and have made this receipt twice i cook it in a cast iron skillet well pleased. I’m so happy to hear that Vickie! It is a bit of work, but I agree, well worth it! Made this a week ago -and it was absolutely delicious! Wondering how it would taste with shrimp instead of chicken? So happy to hear that, Daria! Shrimp would be absolutely delicious! Made this last week and loved it!! Do you think shrimp will work as well? So glad you liked it Bridget! Shrimp would definitely work in this recipe! Hello! I just wanted to thank you for this phenomenal recipe! I happened to have all of these ingredients at home, so I decided to try something new. I made a vegetarian version using Morningstar brand “chicken” strips. I even added in some sautéed mushrooms and sour cream to make it extra creamy. My meat-eating boyfriend even loved it! We are stuffed now. Thanks again! This makes me so happy! Thank you so much for the kind comment. Love the addition of mushrooms and sour cream. I will have to try that! I find all of my recipes on Pinterest and have never commented but this was OUT OF THIS WORLD!!! It might be my new favorite thing! My husband loved it, too and my very picky toddler even ate some! Thank you so much! So happy to hear that!! It’s always great when you find a meal that’s a hit with the whole family! Thanks for the sweet comment! This recipe doesn’t mention how many degrees to bake at for 20 minutes. Am I missing something? How many degrees!? Hi Siobhan, bake at 350. Thanks for letting me know. I’ll update the recipe! Stumbled across this recipe while trying to figure out what to do with the Spaghetti Squash I bought last week. It was delicious. Easy to make. Lots of veggies. really tasty. Thanks! I’m so happy to hear this Nicole! Thanks for the sweet comment and happy holidays to you and your family! Hi Krista! I’m making this for a family meal train and the family has said they are lactose intolerant. What would be a good substitute for the cream cheese? Thanks!! Hi Gillian, great question. I haven’t tried any other versions of this recipe, but I would suggest making a cream sauce with cashews. On a basic level, I’d mix cashews and chicken broth together in a blender or food processor until smooth and creamy. You could also search google for vegan cream cheese recipes. There are some good ones out there that use cashews. It was great! My family isn’t low-carb so I made a separate skillet with pasta, but the spaghetti squash was soo much better. I added some smoked sausage to mine but no doubt it was delicious without as well. Thank you for the recipe!! That’s so awesome to hear Rachael! I love your addition of smoked sausage for another pop of flavor. Thanks for the sweet comment! Googled Spaghetti Squash recipes and came across this one. It looked so good. Made it tonight. What a fantastic meal! It was beyond all my expectations. The only things that I did different was use a large spaghetti squash and boneless/skinless thighs as that is what I had on hand. My wife says it is the best meal I have ever made. We both agree I have made some good ones, but this tops the list. I’m so happy to hear this!! Glad you and your wife loved it! 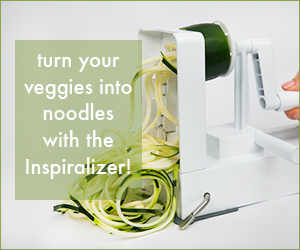 Thanks for circling back and sharing your experience with the recipe! I looked online for spaghetti squash recipes and came across this one. It is now my favorite meal! We could eat this weekly, even my younger kids like it. Thank you for a healthy, delicious recipe! I’m so happy to hear this Nicole! Thank YOU for making it! 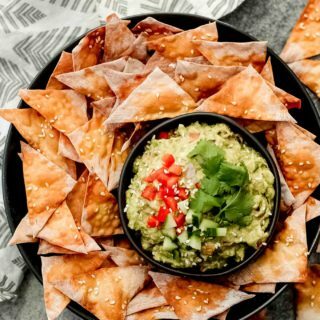 This recipe is deeeeeelicious!!! I admit… I was skeptical but I was wrong!!! If you are looking for a healthy but savory meal, this is it!!! Thank you for sharing your incredible kitchen creations…. YUM!! !